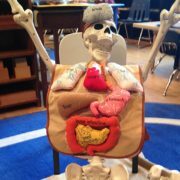 This month we will begin to study and learn about our skeletal system. Why do we need bones? What would we be without them? What do our bones protect? These and so many more questions will be answered. We have added pumpkin work to the science practical life and math shelves. We will also begin our Fire Safety unit. What is an emergency? We will learn all about our 911 system and how to use it if needed. At the end of the month Gig Harbor Fire and Rescue will spend a morning with us. We will finish the unit with time to explore the fire truck with the firefighters. This month we will also make applesauce and visit a pumpkin patch for fun and games with friends.